Prayer wheel at Land of Medicine Buddha, Soquel, CA. 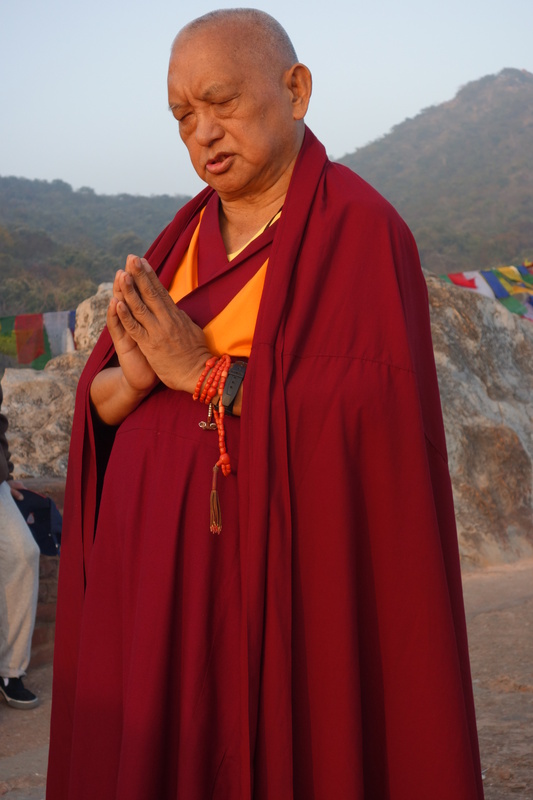 Lama Zopa Rinpoche does prostrations at Vulture’s Peak, the site of Buddha’s first teaching, India, February 2, 2014. Photo by Ven. Roger Kunsang. “[I would like] for the whole organization to build 100,000 prayer wheels in different parts of the world, [including prayer wheels under the ocean], a minimum height of six feet. Prayer wheels are a great blessing for each country. “The prayer wheels should have a very beautiful painted roof, like a house or temple over the prayer wheel with Tibetan or Chinese art. But not like Pizza Hut’s or Kentucky Fried Chicken’s roof and not like a jail. “The reason why I’d like to build as many as possible is because in the texts it says: If you do prayers as a group, then it is a hundred times more powerful than doing it alone in the room. “That is why I am suggesting that when we build a stupa etc, if as many people as possible can participate. This can mean by funding or giving time. People can do different ways, either with money or other ways. “If we do it as the whole organization, as a project, then if everybody offers $10 or $5 pr even smaller thinking that you are contributing to building a stupa, then in this way it becomes everyone’s project. In this way the karma is very powerful if we do it with many people, all together. “This is the same thing when building statues. If you do it like this it is amazing, it can be funded quite easily. The people think that this is also their project, and even if they only have $10 to offer, this way everybody gets benefit. “It does not mean to build these in a time limit, I am just expressing here a general plan. There is no limit of time. I also don’t mean for the centers to do this, I don’t mean to be giving burden to the centers. Roger commented that the cost of building 100,000 would cost about one billion dollars. Lama Zopa Rinpoche at the prayer wheel at Root Institute, Bodhghaya, India. “You shouldn’t think like that. There is no limit of time to build them. If you think of all the things that we have built and spent in the organization so far, if at the beginning you added it up, it would not have seemed possible. It doesn’t help to think like that. It is better to rejoice! “A billion dollars is nothing when you compare to not being born in the lower realms, to have pure rebirth up to enlightenment. A million dollars, even a trillion dollars is nothing compared to the benefit. We are talking about liberation and enlightenment. It has no meaning when compared to the benefits. Even temporary benefits of building a stupa. “We need to have an organizer for each project. We should set this up before we put it in Mandala magazine, so it is more professional. “The idea is to get as many people involved as possible. If you are personally going to build a one-storey stupa, you can’t afford it. But if many people, help by offering $100, $10 or $20, then also you become part of the building. It is incredible. Even children can help, each child donate $1 or $5. This is a very good way of doing it. This way it benefits so many sentient beings, liberates and brings them to enlightenment, even including the insects and mosquitoes landing on the stupa or the worms on the ground, because the rain comes, touches the stupa and flows down on the ground and purifies the worms. To date, approximately 13 large prayer wheels and many smaller prayer wheels have been built. Please rejoice! Prayer wheel at Vajrapani Institute, CA. In progress. 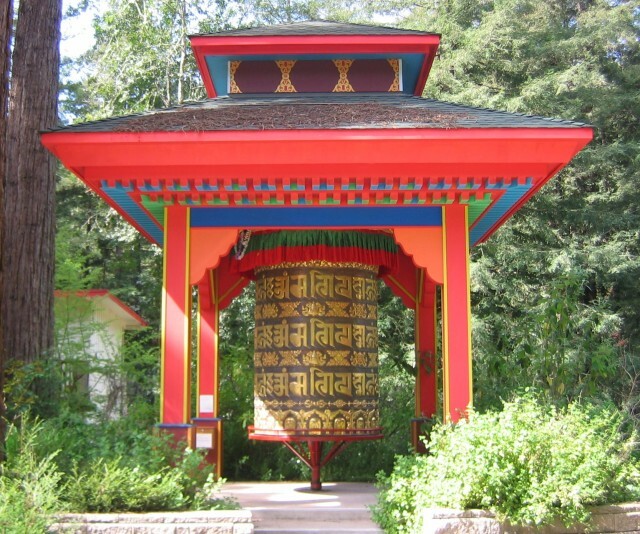 8.2 ft x 6.5 ft prayer wheel containing millions of mani mantras, the other mantras advised by Lama Zopa Rinpoche, as well as a set of the Kangyur and the collection of Lama Tsongkhapa’s writings, Kushi Ling Retreat Center, Italy. 8 feet 2 inches x 3 feet 11 inches diameter containing 108 billion MANI mantras. Completion planned for September 2014. Institut Vajra Yogini, France. large prayer wheel and prayer wheel house at O.Sel.Ling Retreat Center, Spain. Prayer wheel at Dorje Chang Institute, New Zealand, containing 111 billion OM MANI PADME HUM mantras, over 500 Buddhist texts (2 Kangyur, 1 Tengyur, 2 Je Sungbum and others), as well as 5 million other prayers and mantras including Guru Rinpoche prayer and mantra, Five Powerful Deities Purifying Mantras and Vajrasattva and Medicine Buddha mantras as advised by Kyabje Lama Zopa Rinpoche. 10 ft x 7 ft prayer weel at Chandrakirti Meditation Center, New Zealand, containing over ten billion mantras completed by late 2017.
large prayer wheel at Mahamudra Centre, New Zealand. Thubten Shedrup Ling Monastery, Australia. 1.8 meters tall x 1.8 meters diameter contains approximately 250,000,000 mantras including copies of the Dharmakaya Relic Mantras. Also inside the wheel is the complete set of kangyur and half of the tengyur. large prayer wheel and surrounding smaller wheels at Dickey Larsoe Tibetan Settlement, a Tibetan settlement in Bylakuppe, South India. The large prayer wheels contains 100,000,000 OM MANI PADME HUM mantras and nearly 400,000 are included in the smaller prayer wheels. 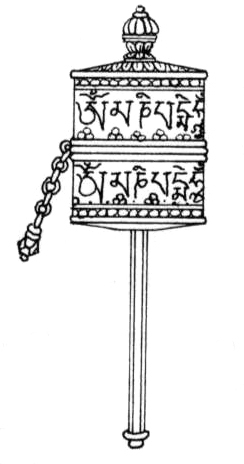 Gigantic prayer wheel, contains: kangyur, 1 set of Lama Tsongkhapa’s teachings, Sutra of Long Life; Chenrezig longest mantra, Kurukulla mantra, Padmasambhava mantra; five powerful deity mantras; Root Institute, Bodghaya, India. In progress: 12 feet in diameter x 15 feet high. Rinchen Jansem Ling, Malaysia. 32 1 ft prayer wheels surrounding the Ksitigharba Statue at Land of Medicine Buddha, CA, USA. 200 prayer wheels, 2 ft x 1 ft, mounted directly onto the walls of The Great Stupa, AUS. In progress. Information on how to fill a prayer wheel. The Stupa Fund is a project of FPMT Inc. and is administered by FPMT International Office located in Portland, Oregon, United States. All donations made to this fund are tax-deductible within the United States in accordance with IRS Code article 501(c)(3) to the extent allowed by law.